I started taking tennis lessons recently. My tennis pro tells us in every class: “Save your shoulders! Do not swing with just your arm, turn your whole body!” All athletes know that – we cannot generate any kind of significant force if we just flail our arms. More then that – if we rely on our arms alone (especially if we are carrying weight, like a golf club or a tennis racket), we are risking shoulder strain, pain and potentially dislocation. This is just as relevant in our daily lives. Whether you drag your heavy suitcase at the airport, pull to open a heavy door or lift your kid, you are risking shoulder strain if you are not mindful about where the movement is coming from. Here are some basic ideas on how to protect your shoulders in your daily life and in your yoga practice. The first thing to remember is that the arm does not function in isolation. 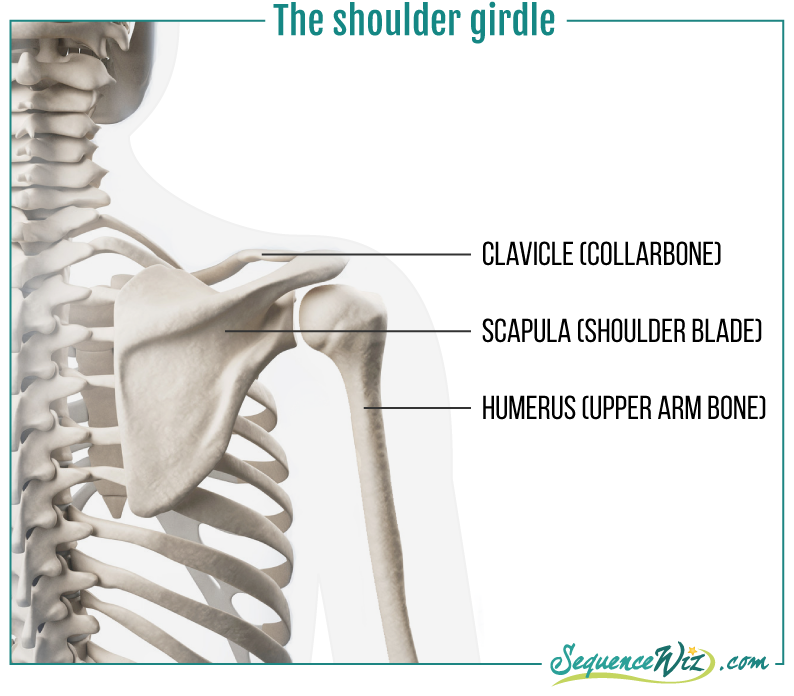 The whole structure is called “the shoulder girdle” and it includes the arm, the clavicle (collar bone) and scapula (shoulder blade). All these structures are meant to work together. What we often see in the yoga classes (as well as daily lives), is limited movement of the shoulder blades. When the shoulder blade doesn’t move much, it is not supporting the shoulder joint. So whatever arm movement you do, try to pay attention to what your shoulder blade is doing and emphasize that movement. This is where we want the arm movement to ORIGINATE FROM, with the arm just following the movement of the shoulder blade. Whenever I work with a student with shoulder issues, the first thing I check is how much awareness/mobility she has in her shoulder blades. 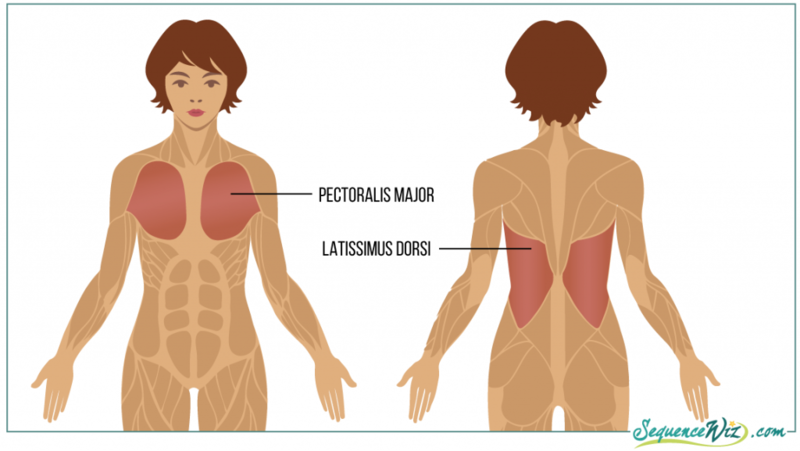 The second thing to remember is that both pectoralis major (chest muscles) and latissimus dorsi (back muscles) attach at the anterior (front surface) of the arm bone. Reflect on that for a moment. It means that when your chest muscles are tight, they will try to rotate your arm internally. It also means that when your lats on the back are tight they will ALSO try to rotate your arm internally. As we’ve already established, excessive internal shoulder rotation can lead to all sorts of problems. That is why when you deal with shoulder issues it is not enough to just stretch the chest (as we often see), but also to release tension in your lats. How do we do that? The easiest way is to add a lat pull down-like movement to your poses. We can add those to Virabhadrasana, Salabhasana, Ardha Uttansana, etc. C. Have your student hold on to your fingers and resist as they pull down, checking to make sure that the movement is coming from the lats. The third important thing is that whatever movement we do in yoga needs to involve the spine. When you move the spine, you end up working with all the structures that bind the shoulder girdle to the spine, making each movement more effective. When we pull the arms down or back, we also flatten the thoracic curve; when we stretch the arms forward, we also round the thoracic curve, when we bring the arm across we also twist the spine, and so on. That is why in my tradition you will rarely see a teacher do any sort of isolated shoulder stretches in a seated or any other static position (except for demonstration purposes). This is because the movement of the shoulder needs to be organically linked to the rest of the body, specifically the movement of the spine, so that the complex network of muscles that connects the shoulder girdle to the spine and ribcage gets alternately stretched and strengthened. Until the student thoroughly understands the three main principles above, he/she has no business doing Sun Salutation-heavy yoga practices and other weight-bearing maneuvers that place a lot of stress on the shoulders; it’s just too risky. Next week we will feature a yoga practice for the shoulders that integrates the principles outlined in this post and the last week’s post. Tune in! If both the pectorals and latissimus dorsi muscles internally rotate the humerus, which muscles are we tightening to externally rotate them? Do you have a diagram? It feels like I am tightening the latissimus dorsi to externally rotate. Back to the books! Speaking of protecting shoulders, I feel less strain on my shoulders doing “yoga push ups” if I move forward and down rather than straight down. Can you interpret that? It seems to somehow protect those tiny little muscles just anterior to the head of the humerus that hurt the day after. Thinking of the tennis example, it seems that by sparing the shoulders, one transfers the force to a twist of the spine with momentum. Hmmm-better have that core turned on. Which is worse, a spinal injury or a shoulder injury? I love this information, Can you please provide a printable copy? Hi Carolyn, thank you for your lovely comment! I usually make the pdf handouts available to Sequence Wiz members as an additional “perk’ of membership simply because it takes time and effort to produce those. I hope that you decide to give us a try and decide for yourself if it is worth your while! thank you for this post – I appreciate the variations on the poses to target these areas. Thanks for this post, love the variations. This is a wonderful article. Thank you! I am always looking for new ideas for shoulders! A PDF would e awesome of this! What can i say – i have to agree fully! I sit on a computer all day – my shoulders are internally rotated (left one more so). And i have problems whenever i do Surya Namaskaars – even down dog, actually. Its a relief when someone points out the reasons behind it. Will follow your shoulder girdle video on YT soon!